Enterprises are moving away from traditional virtualization solutions and transitioning into the cloud. As software development in the enterprise becomes more agile, there is an equivalent demand on IT to provide an infrastructure that is responsive, scalable, highly available and secure. Enterprise IT departments are responding with private cloud and hybrid cloud solutions that provide IT-as-a-Service, a utility approach that delivers an agile infrastructure to the user community, with ultimate control for administrators but self-management for developers and users where appropriate. The promise of the cloud was: simplicity, scalability, availability and reduced operating cost. However, enterprises are quickly finding that current large-scale cloud implementations are often complicated and expensive, often requiring the help of third party integrators. Cloud implementation projects can take months and even years, all while the enterprise needs to focus on doing business. It’s time for enterprises to move away from traditional costly virtualization solutions and drive to the cloud using a more efficient, profitable and scalable solution that can compete in today’s market. It’s time to do this with a cloud solution that delivers on the promise of cloud – Jelastic’s Platform-as-Infrastructure. Here are the top 5 reasons to move to Jelastic’s Platform-as-Infrastructure. One of the biggest barriers for enterprises moving to the cloud with PaaS and IaaS is that cloud solutions can be difficult to install, configure and manage. OpenShift and OpenStack are Open Source solutions that take significant time to install and often need technology expertise to configure and manage. Pivotal and Cloud Foundry are constantly changing architectures and approaches. Which infrastructure software should you pick? Which Open Source distribution is current and which should I use? What plugins work with that distribution and how are they integrated? – is designed for enterprise private and hybrid cloud? – will allow rapid deployment of new apps and legacy apps? Jelastic Platform-as-Infrastructure provides all the software you need to get up and running with a private cloud. You provide the hardware in “bare metal” configuration. Jelastic provides everything else from the OS, infrastructure, tools and management, billing and monitoring, all the way to the platform-as-a-service layer. Installation and configuration in your environment takes hours with Jelastic, not months. You’ve got a mix of applications and some of them are growing every day with more and more demand on resources. It’s a great situation, right? Well, if you are running that application on traditional virtualized systems, it’s likely that you will spend a lot of resources managing scalability issues, determining how and when to allocate new VMs, what to move off servers to free space, etc. Yes, you might be able to vertically scale and even scale out to multiple servers, but it takes a lot of time, configuration effort, potential downtime of applications and stress. 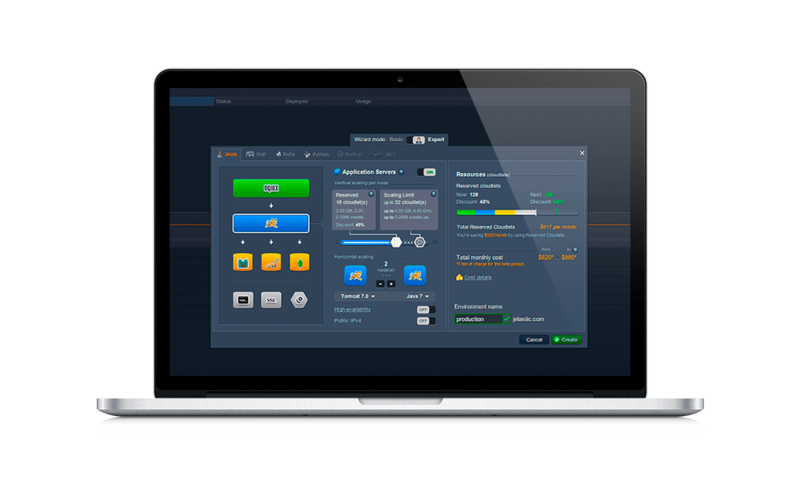 With Jelastic, the developer SELF-MANAGES their application environment including scale-up and scale-out parameters. They simply use the graphical user interface to define their application environment (app servers, load balancers, databases, IP addresses) and set scaling limits within a single server and across multiple servers. After that, scaling happens AUTOMATICALLY, with no configuration or resizing by the customer or the service provider. The application just scales and the customer can be billed for the new resource consumption automatically. Want to manage your own solution from the ground up? How much time and resources are you spending managing servers for your company? How much time is spent updating packages, applying security patches and configuring systems? What about reconfiguring users as they grow? The promise of the cloud is simplicity and efficiency, and the DevOps trend encourages a segregated management approach where IT/operations (the IT department) manages the infrastructure, security, compliance and tools and the developer self-manages the application environment. Jelastic fully embraces this approach. The developer dashboard provides all the tools to configure and deploy an application to the cloud via a simple GUI (and there is also an API for programmatic access to these features). Pick your favorite app server. Add a database if required. Set your limits for vertical and horizontal scaling (if multiple instances are required, load balancers will be automatically configured) and you are ready to go. For the cloud administrator, there is a management GUI (Jelastic Cluster Admin) that provides all the features required for you to setup, configure and manage the cluster of servers that deliver the cloud. Manage servers, users, billing and analytics using this tool. What happens if an application misbehaves and takes the system down? What happens if there is a server failure? Even worse, what happens if there is a security breach? Jelastic was the first commercially available PaaS to recognize the benefits of container technology. With containers, each application and its environment is isolated from the others. This provides a built-in mechanism for security. Applications that crash or misbehave are isolated to their container and do not affect other apps. Each container is controlled for scalability and resource consumption so applications do not consume all the resources on a given server. Jelastic also (uniquely) controls this using live migration of apps across servers if server resources are running short. But don’t all virtualization solutions isolate applications? Can’t all PaaS solutions do this? Well, no. Traditional virtualization solutions provide a complete OS environment to one or more applications, impacting security and making it very difficult to scale once a VM is full. And not all PaaS solutions use containers. Even the ones that do probably require you to use a PaaS from one vendor and an Infrastructure (IaaS) form another. How secure is that? Are the interfaces between the two vendors secure? Fully understood? Optimized? When Amazon changes the functionality of AWS does it notify all the PaaS vendors using the infrastructure? I think we all know the answer to that. Only Jelastic provides the built-in security of a turnkey, rock-solid, integrated solution from the OS up. We pioneered the used of container technology in PaaS and the others followed our lead. Now the industry is talking about the benefits of integrating PaaS and IaaS. We are already there. Jelastic Platform-as-Infrastructure provides application level container isolation but can run multiple environments in a single server, providing all the benefits of multi-tenancy without the risks. As seen above, the management of environments, as they scale, is significantly reduced over VMs also. But Jelastic also offers at least a 30% improvement in density over virtualization solutions because application environments (containers) can auto-scale within a server for a couple of important reasons. Frist, VM environments are almost always over-provisioned to allow for scalability without complex reconfiguration, significantly impacting the density of applications on a server. Jelastic’s auto-scaling features mean that over-provisioning can be minimized or even eliminated since application environments dynamically scale up and down using only the resources they need. Applications that are not in use can even hibernate and release all the server resources back into the pool. Second, Jelastic provides the ability for applications to be migrated to a different server without downtime. This “live migration” provides the ability for popular applications to scale vertically while moving other applications to a different server in the pool. Improved application density provides the service provider with better return on investment. But these features also improve scalability, security and reduce management of customer environments. For enterprises, moving from traditional virtualization to the cloud using PaaS and IaaS can be a daunting proposition. However, the cloud market is growing rapidly and enterprises are recognizing that PaaS allows them to develop and deploy scalable, highly available cloud-based applications in a rapid and agile fashion. Enterprises can capitalize on this new and sticky revenue stream by quickly implementing PaaS and establishing a brand-defining presence in the market. Jelastic provides the only integrated private cloud solution that integrates PaaS/IaaS and is specifically built for enterprises. Quickly implemented and easily configured and managed, Jelastic provides a turnkey private cloud that works. Today. For more information or to start a free, two-week trial, visit us at www.jelastic.com.